MATTESON, Joel Aldrich.governor of Illinois, was born in Watertown, N.Y., Aug. 2, 1808. He attended the public schools of Jefferson county, taught school in Brownsville, N.Y.,and was foreman of the construction of the Charleston and Augusta railroad in South Carolina, 1831-34. In 1834 he settled in Illinois, where he was a state senator for three terms and governor of the state, 1853-57. He was the unsuccessful Democratic candidate for U.S. senator during his term as governor. He was a contractor in building the Illinois and Michigan canal, and upon the failure of the state to reimburse him, he purchased from the state all the iron held for public improvements and the advance in the price prevented his becoming bankrupt. He was president of the Chicago and Alton railroad and conducted several banks on the line of the road. He died in Chicago, I1l., Jan. 31, 1883. Joel A. Matteson, Governor 1853-6, was born Aug. 8, 1808, in Jefferson County, New York, to which place his father had removed from Vermont three years before. His father was a farmer in fair circumstances, but a common English education was all that his only son received. Young Joel first tempted fortune as a small tradesman in Prescott, Canada, before he was of age. 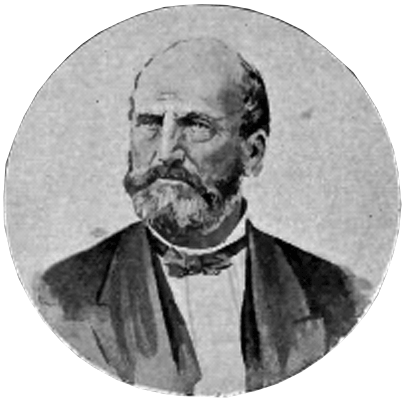 He returned from that place to his home, entered an academy, taught school, visited the principal Eastern cities, improved a farm his father had given him, made a tour in the South, worked there in building railroads, experienced a storm on the Gulf of Mexico, visited the gold diggings of Northern Georgia, and returned via Nashville to St. Louis and through Illinois to his father's home, when he married. In 1833, having sold his farm, he removed, with his wife and one child, to Illinois, and entered a claim on Government land near the head of Au Sable River, in what is now Kendall County. At that time there were not more than two neighbors within a range of ten miles of his place, and only three or four houses between him and Chicago. He opened a large farm. His family was boarded miles away while he erected a house on his claim, sleeping, during this time, under a rude pole shed. Here his life was once placed in imminent peril by a huge prairie rattlesnake sharing his bed. In 1842 he was first elected a State Senator, but by a bungling apportionment, John Pearson, a Senator holding over, was found to be in the same district, and decided to be entitled to represent it. Matteson's seat was declared vacant. Pearson, however, with a nobleness difficult to appreciate in this day of greed for office, unwilling to represent his district under the circumstances, immediately resigned his unexpired term of two years. A bill was passed in a few hours ordering a new election, and in ten days' time Mr. Matteson was returned re-elected and took his seat as Senator. From his well-known capacity as a business man, he was made Chairman of the Committee on Finance, a position he held during this half and two full succeeding Senatorial terms, discharging its important duties with ability and faithfulness. Besides his extensive woolen-mill interest, when work was resumed on the canal under the new loan of $1,600,000 he again became a heavy contractor, and also subsequently operated largely in building railroads. Thus he showed himself a most energetic and thorough business man. He was nominated for Governor by the Democratic State Convention which met at Springfield april 20, 1852. Other candidates before the Convention were D. L. Gregg and F. C. Sherman, of cook; John Dement, of Lee; Thomas L. Harris, of Menard; Lewis W. Ross, of Fulton; and D. P. Bush, of Pike. Gustavus Koerner, of St. Clair, was nominated for Lieutenant Governor. For the same offices the Whigs nominated Edwin B. Webb and Dexter A. Knowlton. Mr. Matteson received 80,645 votes at the election, while Mr. Webb received 64,408. Matteson's forte was not on the stump; he had not cultivated the art of oily flattery, or the faculty of being all things to all men. His intellectual qualities took rather the direction of efficient executive ability. His turn consisted not so much in the adroit management of party, or the powerful advocacy of great governmental principles, as in those more solid and enduring operations which cause the physical development and advancement of a State,of commerce and business enterprise, into which he labored with success to lead the people. As a politician he was just and liberal in his views, and both in official and private life he then stood untainted and free from blemish. As a man, in active benevolence, social virtues and all the amiable qualities of neighbor or citizen, he had few superiors. His messages present a perspicuous array of facts as to the condition of the State, and are often couched in forcible and elegant diction. The greatest excitement during his term of office was the repeal of the Missouri Compromise, by Congress, under the leadership of Stephen A. Douglas in 1854, when the bill was passed organizing the Territory of Kansas and Nebraska. A large portion of the Whig party of the North, through their bitter opposition to the Democratic party, naturally drifted into the doctrine of anti-slavery, and thus led to what was temporarily called the "Anti-Nebraska" party, while the followers of Douglas were known as "Nebraska or Douglas Democrats." It was during this embryo stage of the Republican party that Abraham Lincoln was brought forward as the "Anti-Nebraska" candidate for the United States Senatorship, while Gen. James Shields, the incumbent was re-nominated by the Democrats. But after a few ballotings in the Legislature (1855), these men were dropped, and Lyman Trumbull, an Anti-Nebraska Democrat, was brought up by the former, and Mr. Matteson, then Governor, by the latter. On the 11th ballot Mr. Trumbull obtained one majority, and was accordingly declared elected. Before Gov. Matteson's term expired, the Republicans were fully organized as a national party, and in 1856 put into the field a full national and State ticket, carrying the State, but not the nation. The Legislature of 1855 passed two very important measures, the present free-school system and a submission of the Maine liquor law to a vote of the people. The latter was defeated by a small majority of the popular vote. During the four years of Gov. Matteson's administration the taxable wealth of the State was about trebled, from $137,818,079 to $349,951,272; the public debt was reduced from $17,398,985 to $12,843,144; taxation was at the same time reduced, and the State resumed paying interest on its debt in New York as fast as it fell due; railroads were increased in their mileage from something less than 400 to about 3,000; and the population of Chicago was nearly doubled, and its commerce more than quadrupled. |  |  +--- 6-Zerobabel Westcott,d.?? ?